I really didn’t think the 30/2 cotton was getting onto the loom, but it’s there with only a few tension issues (a tension box or an AVL warping wheel would have made this much smoother). I’ve finally had a chance to sit and weave, fiddling around with tension issues, catching threads, making a temple and what-not, I’ve managed to do 1/4 of a tea towel this evening (it’s only taken me about 2 hours!) I really need to weave a tea towel from throwing that first pic to throwing the last in significantly less then that time then that – possible? I hope so. As you can see from these photo, things are progressing, the pattern is developing (although not quite how I expected from the software rendition), and I’m enjoying using only white and natural. I have several patterns to tryout so each of these tea towels will be in a different pattern. I also have a bunch of 22/2 cottolin colours I want to try so I’m sure I’ll be mixing up the white and natural with the rust, green, blue and brown. I also have a small quantity of Thai cotton that I’d like to incorporate (but then I might use them in a different warp). After searching the net for various homemade temple ideas, I have to say that this one I’ve chosen to try is working pretty well, although the better and the bulldog clips do clash if they get too close (I would like them closer then they like to be). Hook the lease sticks over the raddle to support it and keep both your hands free for tying on to the lead cords.Makes sure you’ve put your lease sticks, one on each side of the cross. Secure sections by tying a knot in the end of the section and then make a loop with your lead yarn (from the sectional warp beam) and hook it around your knot and pull tight. A great example of this can be found here. 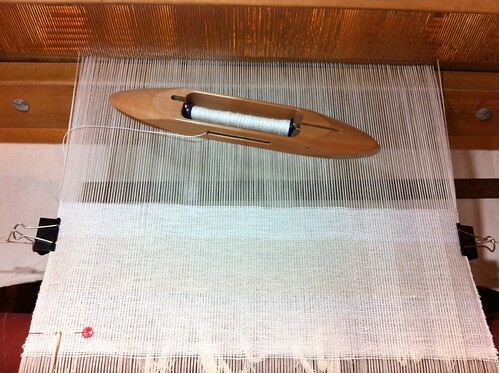 Apply even tension as you wind the sectional warp beam and start rolling it on. This is where a second person comes in really really handy, while one of you turns the sectional warp beam, the other one applies tension to the warp threads and ensures everything stays snag free. 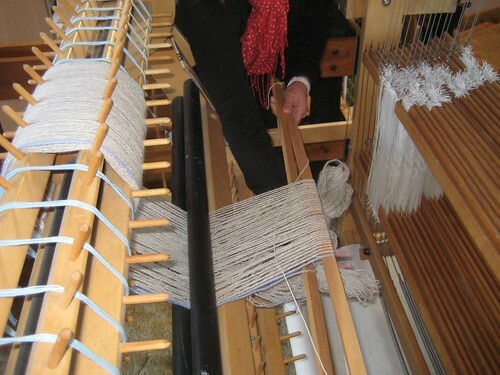 Pull towards front of loom and place two extra lease sticks under the lease sticks holding the threading cross to support it at the back of the shafts. Now it’s time to thread the heddles! 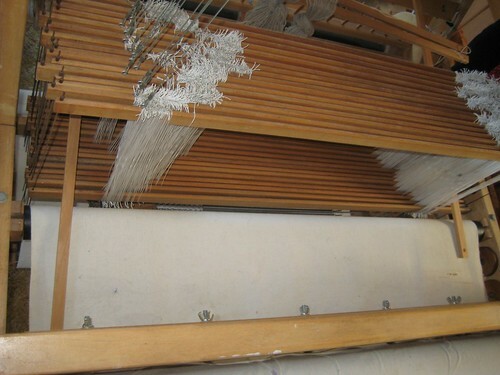 I thread from left to right, dividing the heddles in half, one set on each side of the shaft and then I count out from the left the required number of heddles to be used, in total, for that shaft, then do the same for the other 15 shafts. I then find my first 4 warp ends, note that this is of course where your cross comes in handy because each thread is in order and you can clearly see which is the first thread and the next etc. 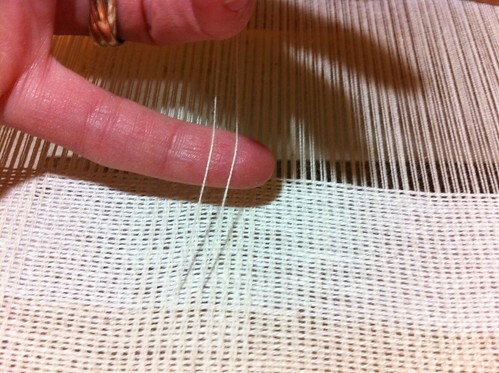 Put one thread between your fingers and using your threading hook, pull the first thread through the eye of the first heddle and follow in using your threading plan. I might do a post with more details of threading heddles and tying onto the apron rod at another time, but that’s all I’ve got for now. I hope this is helpful to to others, it’s helped me with my cotton warp. 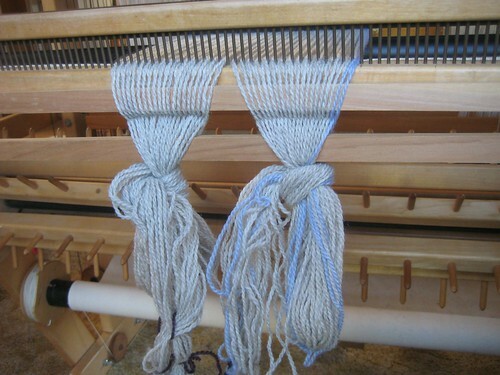 Regarding my cotton warp, I’ve decided two things – I want an AVL warping wheel! 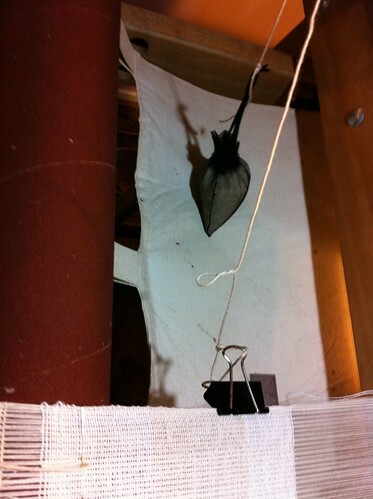 Cotton does not like to sit nicely once it’s been put under tension on the warping mill and then chained off. THe threads relax and twist around each other, the wool did that too but was a hell of a lot easier to separate. And secondly, I need some way to secure my sectional warp beam so that it doesn’t move when I pull the yarn been warped on. If I could do that I could probably warp on by myself. Can you believe that, 65,534 possibilities! It actually starts to make my brain hurt just think about all those possibilities, seriously I’m still getting my head around 4 shaft patterns (oh my!). Right now I want to get my head around how the dobby beg and chain system works. 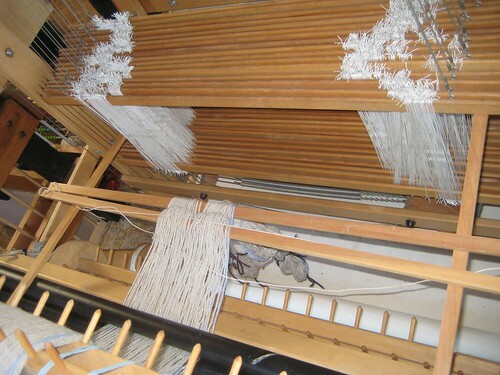 In a future post I’ll go step by step through the warping up of my “teething” warp and thus the various parts of the dobby loom from sectional warp beam to front apron, tie up and my sampler of various weaving structures (that will be a photo heavy post). The AVL manual recommends starting all your projects with this tabby weave for the first inch and or as a header to ensure you’ve got all your threading up error free. 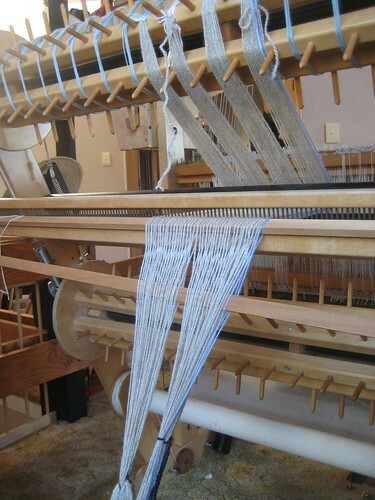 Instead of using a tie-up and treadling plan like you use for other floor looms, with a dobby loom you create a “peg plan”. This is a graph showing the order in which pegs are placed into the dobby bars. Now, lets see if I can explain how to convert a tie-up & treadling plan, into a peg plan! (This is mostly for my own benefit, I could just cut and past the info from the AVL manual, see link below, but I believe I will start to understand the process better myself if I can write it out). that the harnesses are represented down the side of the tie-up, in a peg plan the harnesses are at the top. 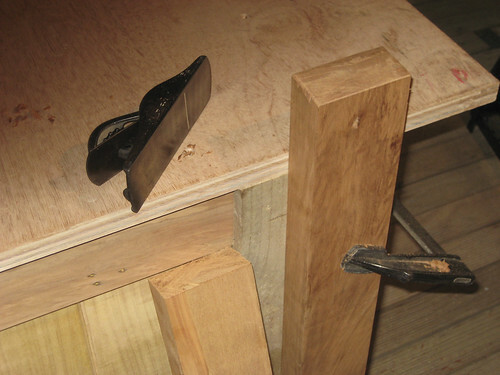 To convert the tie-up from “A” to the peg plan in “B” simply convert black squares down the left hand side of “A” into pegs going across the top (from right to left) on “B”. 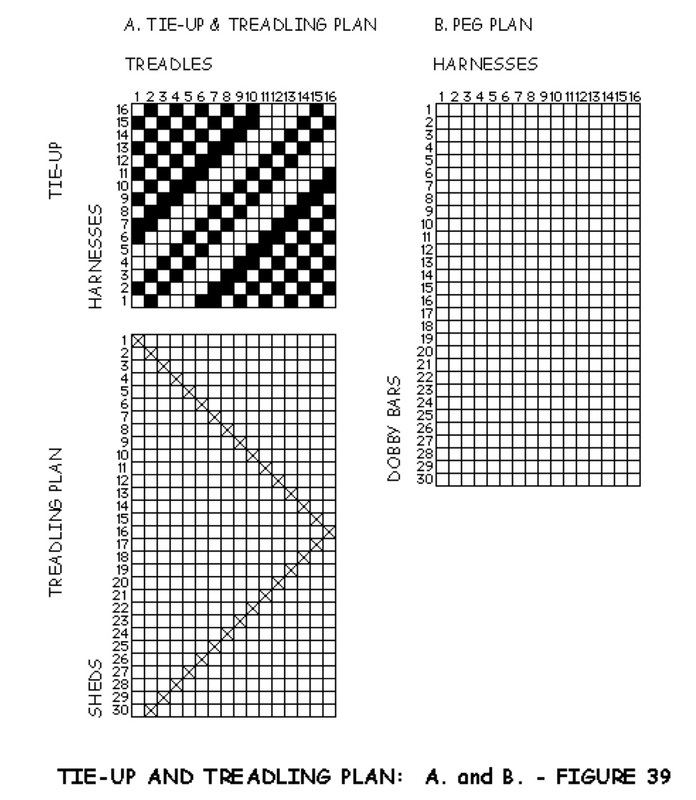 continue to the next treadle and harness sequence (see chart “D”). Now take a look at chart “E”, see how in dobby bar 30, harness 2 there is no peg? 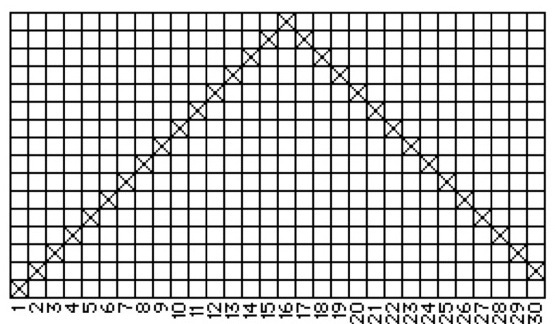 And that continues in a diagonal to form a “V” – compare that to the treadling plan in chart “A” and notice how there is an “x” in the same position, showing when the shed will be formed and thus creating your pattern. How the time has passed! It’s been a really, really long time since we’ve posted anything to this blog. I’m hopping to change that once again as things are getting interesting again in our lives (at least for us) and we are slowly finding more time to do a variety of things. 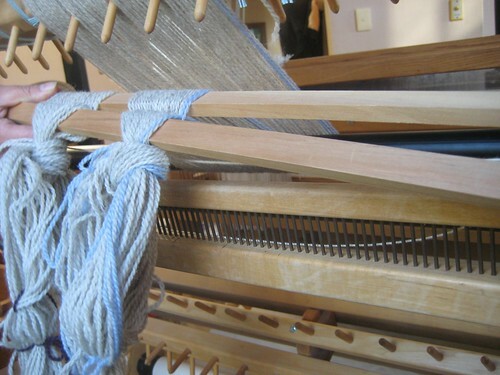 Mostly I (Tracey, your most frequent poster) will be doing a few more articles on weaving, including my exploits into the use of my new (old) 16 shaft AVL Dobby loom. This is not a computerised dobby, but a peg system (I’ll talk more about this later) and weaves a width of about 36″ happily (although it’s about 40″ wide full width). 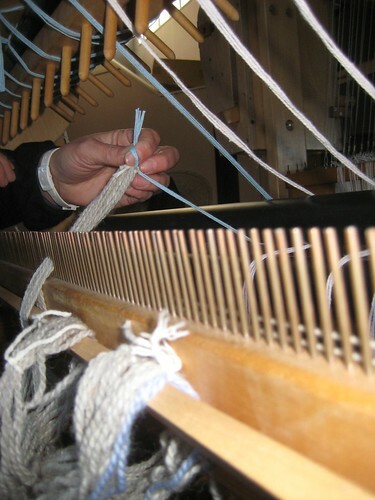 I’m really really loving this loom, loving it like I never have loved a loom before (and remember I now have a large Ashford Rigid Heddle and a 4 shaft countermarch). The Rigid heddle is back in use, currently it’s warped up to teach a friend of mine to weave, but I’m starting to get interested in weaving on it myself once again. However, I’m thinking that I might purchase a small folding loom around 12″ wide and leave the larger rigid heddle for friends to learn on. The other wonderful treat that came along with my gorgeous new loom was the visiting instructor in the form of the equally wonderful Karuna. It has been invaluable to have Karuna come and visit with me on a few mornings, going through how to setup the loom, warp on a “teething” warp as she called it and weaving through half a dozen or so weave structures. I’ll go over this experiment in more detail in a later post too. 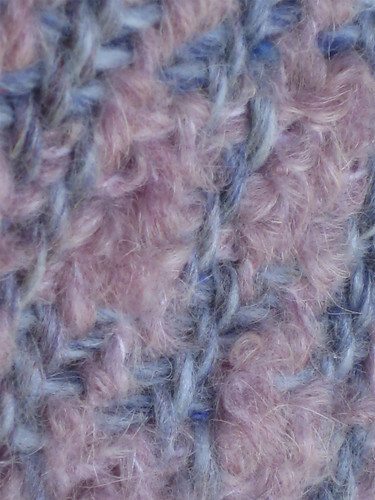 As you can see the yarns aren’t exactly the same WPI, the pink is a little fluffier so it stands out more. I was hopping that after “fulling” it might even out a little but it looks exactly the same, which is fine because I still love it. 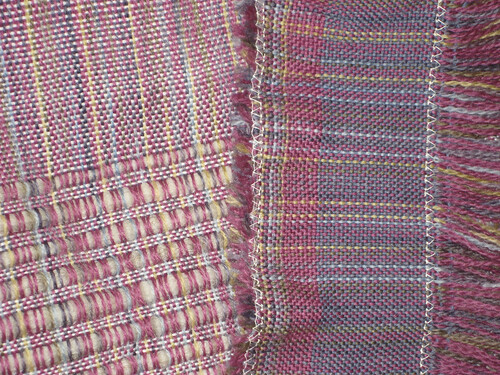 I ended up cutting it off the loom earlier then I had originally planned as the warp threads were really starting to give up the challenge and it had reached a length I was happy with. Final measurements are 123 cm, not including fringe (stared at 220cm under tension) x 74 cm (started at 81 cm in reed). I’m pretty pleased with myself actually. 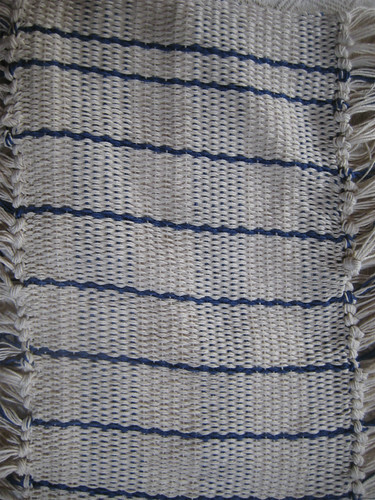 This is my first finished item, warped and woven by me on my 4-shaft floor loom. I’ve learnt a few things from this project, such as taking my time is a good thing, don’t ever use yarn like this again as it’s too fragile for warp really. 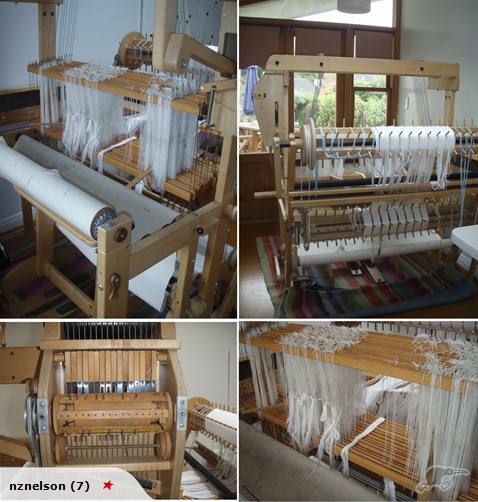 There are a few alterations I’d like to make to my loom, I’d like to add 2 more treadles and I’d like to get rid of the current tensioning system with it’s huge heavy box and lead weights and move to a simpler auto tensioning system. 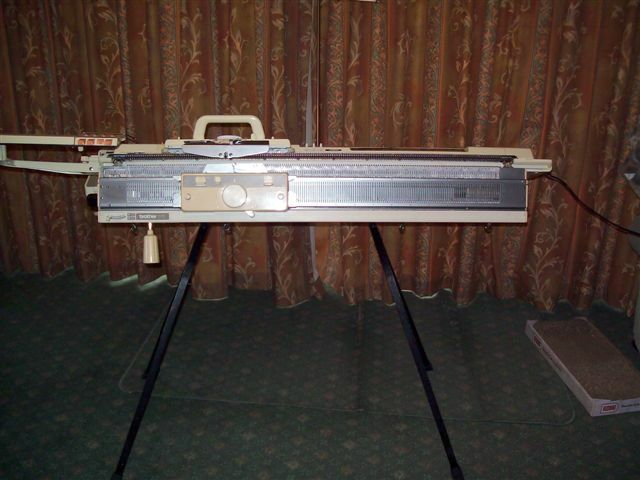 I’d also really, really, really, like to get sectional beam & tension box for future projects. 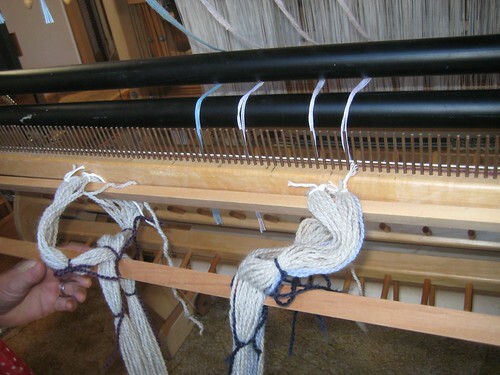 As I’ve mentioned, I’m weaving a baby blanket on the 4-shaft countermarch loom. 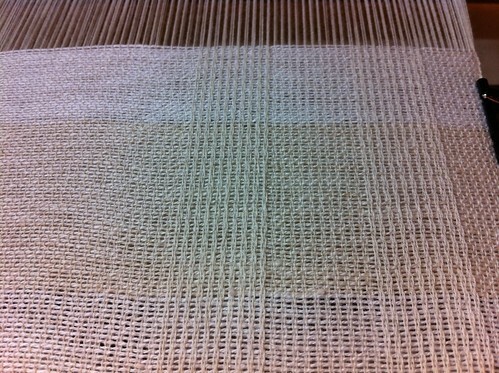 This is my first project on this loom (aside from the sample I did with the previous owners left over warp). The basic pattern comes from the concept and design work of Malin Anderson from The Big Book of Weaving by Laila Lundell & Elisabeth Windesjo (pg 74-75). I’ve altered it as needed to suit the yarn I’m using. 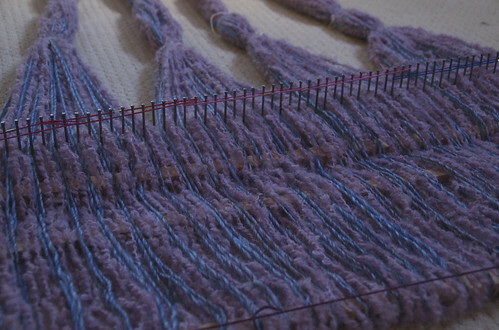 So, I got up to threading my heddles and I became stumped. The pattern says “Selvedges: 2-2, 2 times each side” and I’ve just realised that I’ve only done what lot of 2 for each side, not 2 lots, bugger! Not the end of the world, but it does make me realise why I was having so much trouble trying to figure out what “2-2, 2 times” meant in regards to threading the heddles and sleighing the reed. However, the book still doesn’t mention what time of selvedge this is, I’m going to assume it’s a floating selvedge. 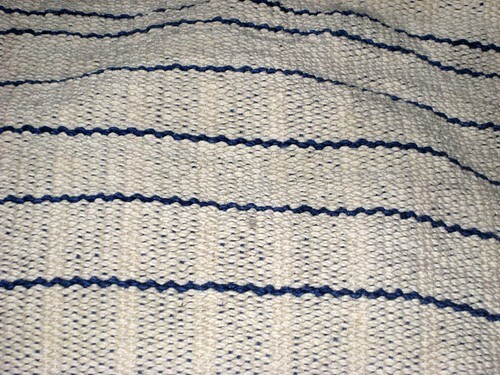 This means that the selvedge threads DO NOT go into heddles, they are threaded, 2 together, through the reed only. So if I had warped correctly I would have ended up with 2 threads in the first dent, two threads in the second dent and same again in the last and second last dents of the reed. I could leave it as is, or I could wrap some more thread around the warping board to get the correct length, weight them at the back to get the right tension and have to more floating selvedge threads ready to weave…. hmmm. Tough. Among all the gardening and income earning, there has also been a little crafting or at least crafting prep, going on. 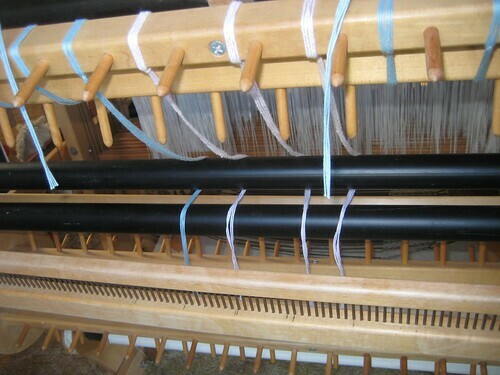 (the red, blue & pink bands are hair ties holding the threads into their 1/2″ slots on the raddle. There are 4 threads per slot. 2 lease sticks hold the cross and a 3rd is inserted into the end loops. Now that the winter rains have passed, Craig has been able to get easy access to the big shed down the back and he’s spent a bit of time recently getting it all set up for hand tool work. I still haven’t gone down in person to see it but it looks fantastic from the photos (makes me jealous, can I kick him out and turn it into a weaving studio do you think *grin*). 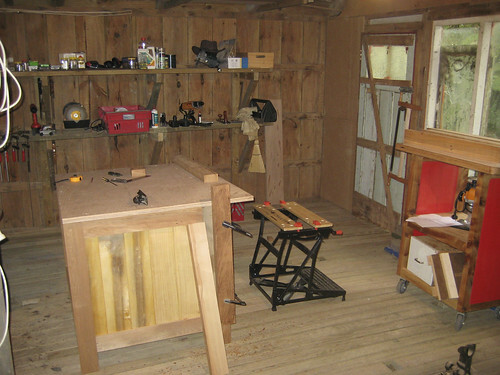 His main woodworking project of late has been to build 2 work benches. One for himself and one for the Earthsong shed. I’m not sure if this is the workbench or the metal working bench he and Kain are building so that they can build a wind turbine. And I think I’ve caught up on just about everything that is going on around here right now. So I finished the handtowels from the Ashford book of riggid heddle weaving using the “8/2” weavers cotton from Ashford. I am so disappointed with these it’s not funny. They finished exactly how I thought they would, thick and not at all what I wanted or what was shown in the photos in the book. These feel and look more like a bath matt. And the “finished” photo of the normal sized handtowel. I was originally so excited to start this project, I was going to make new towels for our household and then more for family and friends. From the day the cotton arrived I thought it was too thick, but hay, what do I know I’ve just started learning all of this, so I continued as per the instructions in the book. Now I don’t know if the book “recipe” is wrong or if the cotton I was sent was wrong, but I’m going to get some 8/2 cotton from another company and see what the difference is. I really really wanted this project to work. Now, my countermarch sample faired much better. So remember, my countermarch loom came with some warp thread still on the back roller. Instead of rewarping from the start I decided to just weave off this yarn. I threaded 1 end per heddle and 2 ends per dent of the reed. 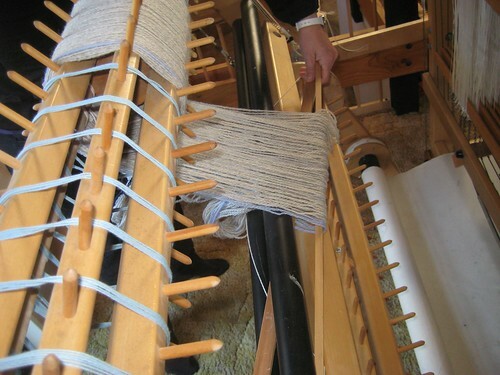 I used two treadles that did a simple pattern lifting shafts 1&3 or 2&4. All I wanted to achieve was a feel for throwing the shuttle, beating and changing the shed. 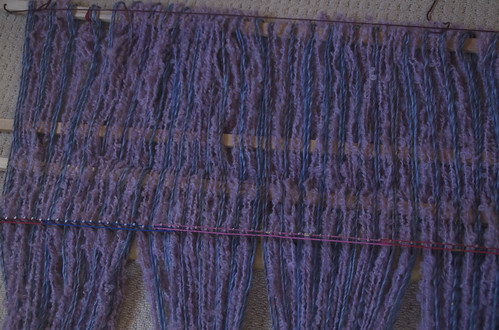 After about 30cms of this I picked up some of the roving I had lying around and pulled off strips and wove that in with 3 picks between each strand of roving. The finished result is 3 blocks of plain and 2 blocks of roving strips, it’s quite a nice first time shawl or table runner. The selvedges are horrid for the most part but they do improve a little. 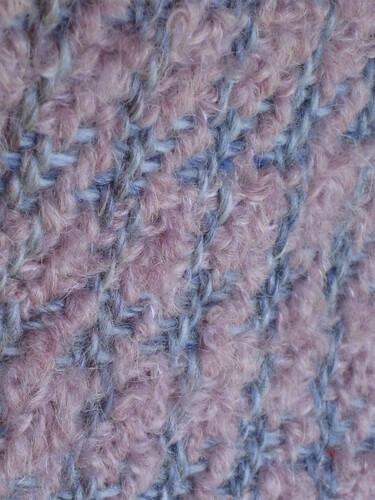 For the last tiny piece of warp I changed my weft yarn from white to a small bit of leftover colour changing warp yarn, then a strip of the pink (the warp yarn although colour changing has mostly pink in it and I was able to get several rows of plain pink) and then I found I had some blue yarn that was very close to the warp thread. 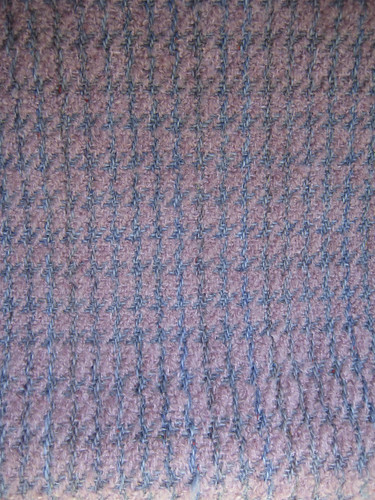 If I was to weave this as an item of clothing or bolt of cloth I’d probably do the blue as the main weft just because you see more colour variation using the blue then the pink, but then I also like the idea of the border of multi and pink before the main body of blue.